All homes currently listed for sale in the zip code 90024 as of 04/18/2019 are shown below. You can change the search criteria at any time by pressing the 'Change Search' button below. "Atop The Remington-a fully-serviced, amenitized high-rise in Westwood Village-is Penthouse 5, a luxe residence framed by panoramic vistas spanning from across LA to Century City, Santa Monica and the Pacific Ocean. A direct access elevator opens to the foyer and 2-story living room, embraced by floor-to-ceiling windows, and flows into the dining room and state-of-the-art kitchen. Designed by LM Pagano Design, the 5,991 S.F. interior is host to three bedroom suites, plus an office and bonus bedroom, including the master retreat with luxurious finishes from handcrafted wallpaper to a marble fireplace, dual baths and a dream-worthy closet. The home also opens to a 1,800 S.F. terrace that serves as an idyllic setting for entertaining or relaxation whilst set to LA's most coveted views. The world-class Remington building likewise grants residents access to the salt-water pool, fitness center, salon/banquet room with a full catering kitchen, game and cards room, outdoor courtyard with fire f"
"Beverly West is an ultra-luxe, 22-story boutique high-rise overlooking the Los Angeles Country Club with 35 breathtaking, light-filled residencies. 360 Views stretch east from Beverly Hills to Hollywood and Downtown, south to Century City and west to the Pacific. Beverly West is the ultimate in Southern California luxury living with amenities ranging from a 24-hour doorman and concierge service, security team and valet, to a saltwater pool and Pilates studio. Five unique design schemes have been expertly tailored to the Beverly West's residences, showcasing the home collections of David Sutherland, Christian Liaigre, Ralph Lauren's City Modern, Armani/Casa, and James Perse's Malibu Collection--all expressing a casual approach to elegance that is distinctly Californian." "One-of-a-kind penthouse expanding the entire top level & enveloped by 360 degree panoramic views, in the coveted Grand. Boasting a spacious & open floorplan w/sliding glass doors to a sprawling covered patio, this home is an entertainer's dream. Beautiful living w/fireplace flows to the media space & dining. Channel your inner chef in the kitchen w/breakfast nook, ample cabinetry for storage, ss appliances & more. Unwind in the grand master w/large picture windows overlooking beautiful vistas, walk-in closets, sleek hardwood floors & decadent bath w/dual vanity sink, soaker tub and glass shower. Additional penthouse features include office with endless built-ins, bar with wine fridge, balconies & rare, private rooftop sports court with gym and full bath. Relish luxury building amenities including 24-hour concierge, valet, pool, spa and gym! Centrally located just moments from Century City and Beverly Hills, there is truly nothing like this exquisite penthouse with remarkable volume!" "Perched high above the Wilshire Corridor, this rear, southwest corner Penthouse condo offers a gracious single level floor plan, with the service amenities of a private home and tremendous panoramic city-to-ocean views. The entrance leads to a grand living room with multiple sitting areas, opening to a luxurious terrace with newly updated glass railings providing unobstructed views. To the right of the living room, French Oak wooden floors lead to a den with built-in bar. The formal dinning room offers floor to ceiling views for unforgettable entertaining. Off the dining room is a large cook's kitchen with a full range of Viking appliances, marble counters, plentiful storage, pantry with service entrance, and breakfast nook perfect for daily gatherings. The fully remodeled penthouse is an opportunity to own a one of a kind penthouse, with true single-family ambiance. The ultimate in high-rise security, privacy and convenience." "Superb Traditional home on the market for the first time in over 50 years! Grand traditional center hall floor plan. 6 bedrooms and 6 bathrooms on a fabulous 22,679 square foot lot with views of the LA Country Club. Located on the most prestigious block in Little Holmby. This home has the potential to be one of the great reimagined homes of Little Holmby." "World class finishes accentuate the magnificent flow of this masterpiece! Minutes from UCLA Rooftop deck and beautiful views of century city and Wilshire corridor. Brand new construction 2018 with top of the line materials & craftsmanship. Wonderful open floor plan with dining area, wet bar, living room/family room, great room with pocket doors to the private yard. Movie Theater, gym, sauna, wine room, game room and heated master bathroom floors. Each room flows seamlessly into one another and are boasting beautiful flooring throughout. The custom kitchen has custom counters and top of the line stainless steel appliances. Tasteful bathrooms with custom designer touches. Master bedroom deck, Alexa Voice activated smart home, security cameras, surrond speakers and much, much more, heated pool & spa, with deck jets and waterfall feature. Please inquire if you would like to buy the home furnished." "Welcome to The Red Door Estate, situated in prime Little Holmby, lies this quintessential California Traditional embodying old-world charm and grace. Behind the red door lies 3 bedrooms plus guest house and studio, an exquisite foyer and expansive wood-paneled living room with a grand fireplace. Experience the refined dining room with windows that frame the view of the picturesque English-inspired garden. The gourmet chefs' kitchen is fully equipped with stainless steel appliances and a light-infused breakfast nook overlooking the backyard. The classic timeless architecture, perfectly complements the enchanting garden with its beautiful veranda, swimming pool, and grassy nook, ideal for entertaining. This beautiful estate also features a modern guesthouse with high ceilings and kitchenette. Moments from Holmby Park, Westwood Village and a short drive to Beverly Hills' best boutiques & restaurants. This home epitomizes warmth and elegance in one of LA's most desirable neighborhoods." "Stunning New Construction Contemporary 6 bed/5.5 bath with elevator. Clean lines & warm, modern designer finishes, high ceilings and incredible indoor /outdoor flow w/ patios & balconies off each room. Privately gated and landscaped and filled with natural light throughout. Open entertainer's floor plan includes living room w/ fireplace & bi-fold door to tranquil front patio w/ fountain. Dining room with soffit ceiling leads to chef's kitchen with island and stainless steel Thermador appliances opening to sunny family room with builtins and bi-fold doors opening to backyard patio, pool & spa. Floating stairs lead to lounge area & 4 upstairs bedrooms including master suite with walk-in closet, large balcony w/ treetop views & spa bathroom w/ dual basins, steam shower & soaking tub. Lower level with media room, bar w/ sink & wine fridge, laundry room, direct access garage & 6th bedroom w/ bath. Close proximity to Westwood Village, UCLA & Westfield Century City Mall. Fairburn Elementary." "Welcome to this elegant brand new 5Bd/5.5Ba modern home situated in a quiet and beautiful neighborhood in prime Westwood area. Plenty of natural sunlight throughout. Large dining room w/ wine cellar and a tastefully designed kitchen equipped with state of the art appliances. Open floor plan perfect for entertainment. Family room w/ fireplace has pocket doors, seamlessly providing indoor-outdoor living. Large grassy backyard with sparkling pool/spa. Upstairs, the grand master suite w/ fireplace, separate his/her closets, and large balcony. In addition, 3 junior suites w/ en-suite bathrooms, and laundry room. Security cameras around the house." "Set back from the street on an oversized lot with mature secluded landscaping, this pristine, 2-story home's entirely flat backyard provides great outdoor spaces ideal for entertaining. Over 4,000 sq. ft. with attached 2-car garage, 4 bedrooms (Large Master Suite with 2 walk-in closets & spa-like bathroom, plus 2 additional bedrooms and full bathroom up + 1 bedroom with en-suite bathroom down), and office/5th bedroom upstairs plus 2nd office & powder room downstairs. Wonderful formal spaces incl. large Dining Room & Living Room. Open Kitchen flows seamlessly into the Breakfast area & Family Room that all open to the quintessential California outdoor patio & yard space. The Cook's Kitchen has Wolf Range, Viking Oven, Miele Dishwasher, Sub-Zero Refrigerator, and center prep island. Just minutes to Westwood Village and UCLA as well as Century City and Beverly Hills. Close to shops, restaurants, entertainment, and all the Westside of LA has to offer. Come home to 728 Woodruff Avenue." "This newly constructed 5-bedroom, 5.5-bathroom traditional masterpiece offers 4,000 +SQ FT of open concept living space that has been thoughtfully designed to showcase California's indoor-outdoor lifestyle. The fully equipped gourmet Chef's kitchen with stainless steel appliances and large preparation island is the focal point of the home. It opens to a tranquil family room with panoramic sliding glass doors that integrate the indoor and outdoor spaces, which features a huge back yard and a sparkling pool and spa. The main floor boasts spacious formal living and dining spaces with adjacent butler's pantry a guest suite with private bathroom, a dedicated office, and staircase. The second floor offers an expansive master suite featuring, luxurious appointments including a spacious master bath with tub and shower for two and dual vanities. The master suite has been meticulously crafted with high-vaulted ceilings, fireplace, and large open balcony overlooking the backyard." 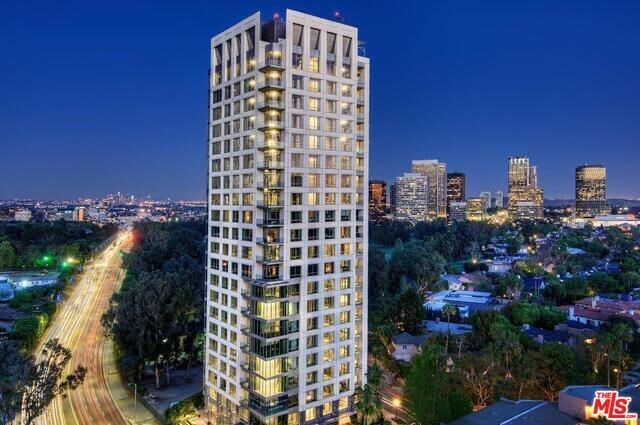 "Resting high atop one of Wilshire Corridor's most premier high-rise residences, this unit offers a rare opportunity to access the glamour & prestige of The Remington from the 20th story. Direct elevator access invites one from the private vestibule area into this 3 bed, 4.5 bath unit w/over 3,300 sq. ft. of luxury living. Bathed in natural light, the sweeping floor plan delivers 270 degrees of captivating views stretching from the city to the ocean. 5 balconies, floor to ceiling windows & wood floors can be found throughout. The sprawling great rm features a f/p, dining area, den & kitchen w/breakfast bar. Double door entry to the Master suite consists of 2 balconies ideal for basking in the sunset's splendor. Dual Master baths w/stone counter tops, spa tub as well as a grand walk-in closet. Bldg amenities include valet parking, concierge, gym, library, card room, pool, storage & temp controlled wine cellar. The unit also offers 3 parking spaces. An unmatched level of luxury & class." "Luxury living in Little Holmby with this four-bedroom, four-bath home that is fantastic for entertaining. Sweeping living and dining areas open to a huge flagstone patio area with built-in barbeque and water features. This home has high ceilings with light, glass and recessed lighting everywhere. The tremendous stunning cooks' kosher kitchen features Sub Zero and Wolf appliances, including two Sub Zero refrigerator/freezers. The floors are beautiful Italian porcelain tile. The master suite with lovely green views is extremely private. The lower level has one bedroom and bath plus a huge family room and tons of storage. There's a basketball court off the family room. This amazing home offers parking for up to six cars. Warner Avenue Elementary School is close by. This home is a must see!" "Experience the ultimate in luxury living at the prestigious Carlyle Residences, the most coveted & sought-after high rise along the Wilshire corridor. Impeccably maintained rare 3-bedroom, 4.5 bathroom, offers soaring high ceilings, expansive windows & spectacular SE exposure. Panoramic views from Beverly Hills to the ocean. Elevator opens to private foyer. Spacious living & dining room areas offer abundant natural light, fireplace & balcony. Chef's kitchen features top-of-the-line appliances, built-in espresso machine, center island & breakfast area. Oversized Master bedroom suite includes two large walk-in closets & his & her separate master bathrooms. Two additional bedroom suites & bathrooms, powder room & laundry room. Grand Lobby leads to designer fitness center, private club room with Fendi-Casa furnishing, dining room, catering kitchen, heated pool, outdoor gardens & fireside seating. Includes 2 parking spaces, storage room & wine locker. The epitome in amenities with 24-hour concierge service, doorman & valet parking. Efficiently managed by in-house staff & engineering this is luxury worry-free living at its finest. Location adjacent to Beverly Hills & Rodeo Drive with easy walking distance to UCLA, shops & restaurants of Westwood Village." "A magnificent & completely renovated hard-to-find 3Bed./3.5Bth residence with most sought-after unobstructed serene mountain views in the fabulous Wilshire House, LA's most prestigious high-rise. Elegant & formal entry hall way leads to a spectacular, spacious & open Living & Dinning rooms graced with finest quality wood flooring and breath taking views. Custom-designed & stylish gourmet's kitchen with top-of-the line stainless steel appliances and a large and bright breakfast area, a sumptuous Master suite with enormous walk-in closet and a one-of-a kind Master bath with panoramic mountain views. Additionally there is an exquisite 2nd. bedroom en-suite ideally located off the kitchen , a 3rd. bedroom converted into a den/library area with its own bathroom and pocket doors and a separate Powder room. This highly sophisticated & stylish unit offers wrap around balconies with floor-to-ceiling windows through out. For your most discerning Buyers!" "Live the Westwood lifestyle at its finest! Designer done, new construction home in the heart of Westwood! This home offers over 4500 sqft of living space with 3 levels and an elevator. Featuring 5 beds, 6 bath, and a huge bonus room, this home is an entertainer's dream! Step inside to see gorgeous hardwood flooring and an impressive kitchen with marble countertops, center island and top of the line stainless steel appliances. Step outside through an open air sliding door to see a big backyard with a gorgeous patio seating area complimented by a swimmers pool with a beautiful flowing fountain and jacuzzi. This home also offers spectacular views of the westside from each balcony. The master suite features a huge walk in closet along with a gorgeous spa bathroom offering a large shower and a bathtub. Just minutes from all of the restaurants and shops in the brand new Century City Mall and iconic Westwood Village. Come see this fabulous home today!" "This urban retreat epitomizes state-of-the-art living where design meets technology. Juxtaposing striking clean lines with warm inviting textures, this inventive modern pays homage to the elements of nature. With an open floor plan, the expansive living room leads to a dining room accented with an eye-catching chandelier, flanked by a cutting-edge stone wall & floating fireplace. The light-filled living room w/ oversized Fleetwood doors opens to the deck overlooking an outdoor kitchen & fire pit. Ideal for entertaining, the chefs' kitchen is equipped w/ a large island, walk-in pantry and Sub Zero stainless steel appliances, including built-in espresso maker and dual dishwashers. Architectural staircase leads to a grand master suite and ensuite bathroom as well as three other spacious rooms. Equipped w/ the latest in surround sound and security systems, it is ideal for the tech savvy. Moments from BH, Century City & Westwood, this innovative modern is the perfect place to call home." "Little Holmby's rare architectural gem! Remodeled to blend a modern and custom style with incredible flow for entertaining. This bright and spacious home offers formal living and dining rooms and gourmet kitchen that opens to a casual dining area and family room with French doors leading to multiple outdoor terraces. Chef's kitchen comes fully equipped with top-of-the-line stainless steel appliances and recently built adjacent laundry room. All four bedrooms are ensuite. Other features include intricate stainless glass window details, custom cabinetry throughout, loft area upstairs that could be used as an office or den, high ceilings with stunning wood beams and industrial light fixtures. Ample outdoor entertaining space, multiple balconies, a roof top deck, grassy yard and lush landscaping throughout plus a 2 car garage with spacious and separate home gym area. Conveniently located near UCLA, Westwood Village, Holmby Park and much more." "Set serenely above the street, this updated traditional home combines the elegant character of the Little Holmby neighborhood with a modern floorplan and amenities. Light and bright with a 2-story entry and hardwood floors, the main level features a formal living room with romantic bay window and fireplace, grand formal dining room with high ceilings, powder room, gourmet center island kitchen with granite counters, subzero, and breakfast bar overlooking sizable family room with fireplace and built-ins. Upstairs are 5 family bedrooms including spacious master with vaulted ceilings, grand closet and newly remodeled bath including stall shower, free standing tub and sauna. French doors upstairs and downstairs lead to the private terraced yard with lower covered patio and grassy pad plus upper patio with spa and play area. Additional features include 2 zone HVAC, 2-car garage, separate laundry and pantry rooms, side service entrance and is in the coveted Warner Avenue school district."